Topaz Electric Heavy fixture locknut of trade size 3/8-Sq-Inch, fastens threaded conduit to unthreaded opening in a box or enclosure. 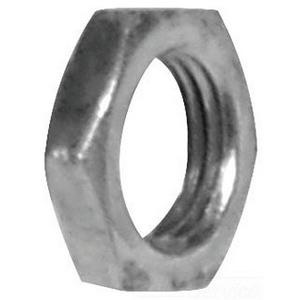 This 1-Inch threaded locknut features stamped steel construction that offers resistance to corrosion. Superior clean threads ensure tightening without distortion. It has thickness of 0.22-Inch. It comes with rugged tangs for extensive reach and ensured bonding. This locknut is ideal for rigid and IMC conduit fittings.